Last night I went on a date with a younger man. Much younger. Like 32 years younger. Robbie and I went to the St. Lawrence Fall Festival. I won ride and food tickets from an Indy with Kids giveaway hosted by Rebeca at The Average Parent. If there is one thing Robbie loves, its amusement rides. Unfortunately, we didn't make it to Holiday World this year, so I thought this might be a small consolation. Plus, while we spend a lot of time in the car together driving people from place to place, it had been a while since Robbie and I had done something fun, just the two of us. So we headed to the Fall Festival. 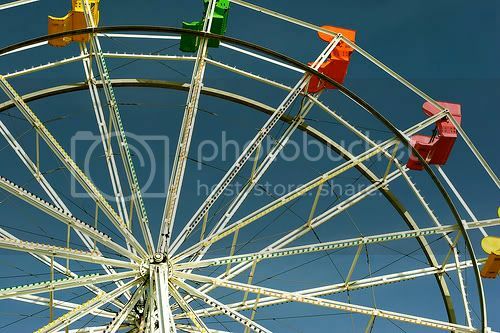 Once we were there, we circled the carny rides one, kind of getting the lay of the land. Then Robbie decided he wanted to try the Fun House. Although I hadn't planned to do any of the rides, the Fun House wasn't really a ride and I thought he might have more fun if I went with him. It was pretty lame. But we made the most of it. Then he went on that roulette wheel ride where you stand up against the sides and it spins around, the raises to an upright position, still standing. I couldn't even watch without getting queasy. By then, we had 1 ride ticket left. Although I had told myself I wasn't going to buy anything while we were there, I did shell out $5 for another 5 tickets so he could ride two more rides. We circled the area once again, when he stopped in front of the Ferris wheel. He pointed and said, "I want to go on that." "Ok. You get in line and I'll wait right here." "But Mom, I think it says you have to have a parent with you." It didn't. But it was sweet that he wanted me to go with him. Clearly he was unaware how I feel about being high in the air with my feet dangling over the edge of my seat. "I don't think it says that," I said, trying to weasel out of the experience. He was unconvinced. So I tried to touch his compassionate side. "Robbie, I am REALLY afraid of heights. I don't like to be way up there," pointing to the top of the wheel. "It'll be ok, Mom," he assured me. "Just think of it like there are Peppermint Patties all around you." He's no dummy. Knowing that Peppermint Patties are one of my favorite candies, he was trying his best confectionary psychology on me. Who could say no to that? Not me...which is how I ended up sitting next to him in an orange bucket on the Ferris wheel. I really must love that kid a lot. My hands gripped the bar like a baby grabs your hoop earring in the middle of church. Locked in tight, the guy running the wheel sent us backwards on our way. I was ok for 20 seconds until we got higher than 10 feet in the air. That is the point at which Robbie's lesson in fear-induced colorful language began. Because this is a family-friendly blog, I won't repeat here what I repeated with insistence up in that death trap Ferris wheel bench. For his part, Robbie kept saying "Open your eyes, Mom. Think of Peppermint Patties." What I was thinking about was trying to get the attention of the ride operator. "Stop this thing!" I yelled as we spun by. Unfortuntely he didn't hear me, so we were on the way up again. Cue the colorful language. When we came around again, I got the guy's attention, having let go of the death grip I had on the lock bar so I could wave my arms at him. "Can I get off and let him keep riding?" "Well, I have to keep the weight balanced," he said. "Areyoufreakingkiddingme," I thought. I wasn't going to let my very real fear stand in the way of Robbie having fun. Lucky for me, just as I was settling in to the idea that I was going to have to stay on the ride, two boys walked up and the ride operator decided it would work for them to sit with Robbie for the rest of the ride. I stood close by and waved big at him every time that orange bucket came around, which was about 10 more times. I honestly am not sure I would have survived that! Once his turn on the Ferris wheel was over, I apologized for bailing early. "That's ok, Mom," he said. "Let's get something to eat." Now there was a festival activity I could get behind.